Although not converting, Charles Darwin like Antony Flew struggled until his dying accepting that the universe came about by chance!!! Scientist Dr. Henry “Fritz” Schaefer gives a lecture on the cosmological argument and shows how contemporary science backs it up. 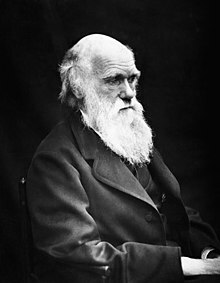 Charles Darwin wrote THE ORIGIN OF THE SPECIES and it was published in November of 1859, and at that time Darwin was still a theist. However, later in life he became an agnostic. Francis Schaeffer pointed out that Darwin’s letters later in his life gave the reasons for him leaving Christianity behind. One of those reasons was that it conflicted with his theory, but yet late in his life he still struggled with his view that the universe came about by chance. I have included a quote from Antony Flew where he quotes Darwin’s THE ORIGIN OF THE SPECIES and I think he has a good point that Darwin at that time did think a Divine Mind was behind the creation. Nevertheless, Darwin did lose his faith and leave Christianity, but evidently he agonized over this even up until a few months before he died in 1882. This same issues weighed heavy on Flew’s mind too in the last decade of his life and he embraced theism. a few of these below. of science like Richard Swinburne and John Leslie. Templeton Prize for their contributions to this exploration. shedding light on the issues discussed here. I have said that in one respect my mind has changed during the last twenty or thirty years. Up to the age of thirty, or beyond it, poetry of many kinds, such as the works of Milton, Gray, Byron, Wordsworth, Coleridge, and Shelley, gave me great pleasure, and even as a schoolboy I took intense delight in Shakespeare, especially in the historical plays. I have also said that formerly pictures gave me considerable, and music very great delight. But now for many years I cannot endure to read a line of poetry: I have tried lately to read Shakespeare, and found it so intolerably dull that it nauseated me. I have also almost lost my taste for pictures or music. Music generally sets me thinking too energetically on what I have been at work on, instead of giving me pleasure. I retain some taste for fine scenery, but it does not cause me the exquisite delight which it formerly did. On the other hand, novels which are works of the imagination, though not of a very high order, have been for years a wonderful relief and pleasure to me, and I often bless all novelists. A surprising number have been read aloud to me, and I like all if moderately good, and if they do not end unhappily—against which a law ought to be passed. A novel, according to my taste, does not come into the first class unless it contains some person whom one can thoroughly love, and if a pretty woman all the better. This curious and lamentable loss of the higher æsthetic tastes is all the odder, as books on history, biographies, and travels (independently of any scientific facts which they may contain), and essays on all sorts of subjects interest me as much as ever they did. My mind seems to have become a kind of machine for grinding general laws out of large collections of facts, but why this should have caused the atrophy of that part of the brain alone, on which the higher tastes depend, I cannot conceive. A man with a mind more highly organised or better constituted than mine, would not, I suppose, have thus suffered; and if I had to live my life again, I would have made a rule to read some poetry and listen to some music at least once every week; for perhaps the parts of my brain now atrophied would thus have been kept active through use. The loss of these tastes is a loss of happiness, and may possibly be injurious to the intellect, and more probably to the moral character, by enfeebling the emotional part of our nature. This is the old man Darwin writing at the end of his life. What is saying here is the further he has gone on with his studies the more he has seen himself reduced to a machine as far as aesthetic things are concerned. We go through this we find that his struggles and my sincere conviction is that he never came to the logical conclusion of his own position, but he nevertheless in the death of the higher qualities as he calls them, art, music, poetry, and so on, what he had happen to him was his own theory was producing this in his own self just as his theories a hundred years later have produced this in our culture. I don’t think you can hold the evolutionary theory as he held it without becoming a machine. What has happened to Darwin personally is merely a forerunner to what occurred to the whole culture as it has fallen in this world of pure material, chance and later determinism. Here he is in a situation where his mannishness has suffered in the midst of his own position. Charles Darwin (1809–1882), who proposed the theory of evolution by means of natural selection. I may say that the impossibility of conceiving that this grand and wondrous universe, with our conscious selves, arose through chance, seems to me the chief argument for the existence of God; but whether this is an argument of real value, I have never been able to decide. I am aware that if we admit a first cause, the mind still craves to know whence it came from and how it arose. Nor can I overlook the difficulty from the immense amount of suffering through the world. I am, also, induced to defer to a certain extent to the judgment of many able men who have fully believed in God; but here again I see how poor an argument this is. The safest conclusion seems to me to be that the whole subject is beyond the scope of man’s intellect; but man can do his duty. What he (Darwin) is saying is that at this point I have no answer, but the interesting thing is he puts a semicolon after that and then says, “but man can do his duty.” Darwin understands what he has said undercuts all duty and all morals. So he adds as a faith sentence, “but man can do his duty.” It doesn’t fit really, but he adds because he sees that he must say this because otherwise what happens to man? You can switch on further down the road and Darwin would be appalled to see where his own position has been taken, to Freud and Deterministic psychology. Modern Man has a dilemma because the word “duty” doesn’t have a meaning anymore. Nevertheless you have expressed my inward conviction, though far more vividly and clearly than I could have done, that the Universe is not the result of chance. But then with me the horrid doubt always arises whether the convictions of man’s mind, which has been developed from the mind of the lower animals, are of any value or at all trustworthy. Would any one trust in the convictions of a monkey’s mind, if there are any convictions in such a mind? Can you feel this man? He is in real agony. You can feel the whole of modern man in this tension with Darwin. My mind can’t accept that ultimate of chance, that the universe is a result of chance. He has said 3 or 4 times now that he can’t accept that it all happened by chance and then he will write someone else and say something different. 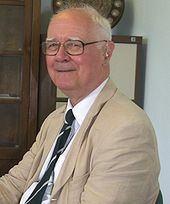 The Rev Dr John Charlton Polkinghorne, KBE, FRS (born 16 October 1930) is an English theoretical physicist, theologian, writer, and Anglican priest. A prominent and leading voice explaining the relationship between science and religion, he was professor of Mathematical physics at the University of Cambridge from 1968 to 1979, when he resigned his chair to study for the priesthood, becoming an ordained Anglican priest in 1982. He served as the president of Queens’ College, Cambridge from 1988 until 1996. Polkinghorne is the author of five books on physics, and 26 on the relationship between science and religion; his publications include The Quantum World (1989), Quantum Physics and Theology: An Unexpected Kinship (2005), Exploring Reality: The Intertwining of Science and Religion (2007), and Questions of Truth (2009). The Polkinghorne Reader (edited by Thomas Jay Oord) provides key excerpts from Polkinghorne’s most influential books. He was knighted in 1997 and in 2002 received the £1 million Templeton Prize, awarded for exceptional contributions to affirming life’s spiritual dimension. Polkinghorne was born in Weston-super-Mare to Dorothy Charlton, the daughter of a groom and George Polkinghorne, who worked for the post office. John was the couple’s third child. There was a brother, Peter, and a sister, Ann, who died when she was six, one month before John’s birth. Peter died in 1942 while flying for the Royal Air Force during the Second World War. He was educated at the local primary school in Street, Somerset, then was taught by a friend of the family at home, and later at a Quaker school. When he was 11 he went to Elmhurst Grammar School in Street, and when his father was promoted to head postmaster in Ely in 1945, Polkinghorne was transferred to The Perse School, Cambridge. Following National Service in the Royal Army Educational Corps from 1948 to 1949, he read Mathematics at Trinity College, Cambridge, graduating in 1952, then earned his PhD in physics in 1955, supervised by Abdus Salam in the group led by Paul Dirac. He joined the Christian Union of UCCF while at Cambridge and met his future wife, Ruth Martin, another member of the Union and also a mathematics student. They married on 26 March 1955, and at the end of that year sailed from Liverpool to New York. Polkinghorne accepted a postdoctoral Harkness Fellowship with the California Institute of Technology, where he worked with Murray Gell-Mann. Toward the end of the fellowship he was offered a position as lecturer at the University of Edinburgh, which he took up in 1956. After two years in Scotland, he returned to teach at Cambridge in 1958. He was promoted to reader in 1965, and in 1968 was offered a professorship in mathematical physics, a position he held until 1979, his students including Brian Josephson and Martin Rees. For 25 years, he worked on theories about elementary particles, played a role in the discovery of the quark, and researched the analytic and high-energy properties of Feynman integrals and the foundations of S-Matrix theory. While employed by Cambridge, he also spent time at Princeton, Berkeley, Stanford, and at CERN in Geneva. He was elected a Fellow of the Royal Society in 1974. Polkinghorne decided to train for the priesthood in 1977. He said in an interview that he felt he had done his bit for science after 25 years, and that his best mathematical work was probably behind him; Christianity had always been central to his life, so ordination offered an attractive second career. He resigned his chair in 1979 to study at Westcott House, Cambridge, an Anglican theological college, becoming an ordained priest on 6 June 1982 (Trinity Sunday). The ceremony was held at Trinity College, Cambridge and presided over by Bishop John A. T. Robinson. He worked for five years as a curate in south Bristol, then as vicar in Blean, Kent, before returning to Cambridge in 1986 as dean of chapel at Trinity Hall. He became the president of Queens’ College that year, a position he held until his retirement in 1996. He served as canon theologian ofLiverpool Cathedral from 1994 to 2005. In 1997 he was made a Knight Commander of the Order of the British Empire (KBE), although as an ordained priest in the Church of England, he is not styled as “Sir John Polkinghorne”. He is an Honorary Fellow of St Chad’s College, Durham and awarded an honorary doctorate by theUniversity of Durham in 1998; and in 2002 was awarded the Templeton Prize for his contributions to research at the interface between science and religion.He spoke on “The Universe as Creation” at the Trotter Prize ceremony in 2003. He has been a member of the BMA Medical Ethics Committee, the General Synod of the Church of England, the Doctrine Commission, and the Human Genetics Commission. He served as chairman of the governors of The Perse School from 1972 to 1981. He is a fellow of Queens’ College, Cambridge and was for 10 years a canon theologian of Liverpool Cathedral. He is a founding member of the Society of Ordained Scientists and also of the International Society for Science and Religion, of which he was the first president. He was selected to give the prestigious Gifford Lectures in 1993–1994, which he later published as The Faith of a Physicist. In 2006 he was awarded an honorary doctorate by the Hong Kong Baptist University as part of their 50-year celebrations. This included giving a public lecture on “The Dialogue between Science and Religion and Its Significance for the Academy” and an “East-West Dialogue” with Yang Chen-ning, a nobel laureate in physics. He is a member of staff of the Psychology and Religion Research Group at Cambridge University. Polkinghorne said in an interview that he believes his move from science to religion has given him binocular vision, though he understands that it has aroused the kind of suspicion “that might follow the claim to be a vegetarian butcher.” He describes his position as critical realism and believes that science and religion address aspects of the same reality. It is a consistent theme of his work that when he “turned his collar around” he did not stop seeking truth. He believes the philosopher of science who has most helpfully struck the balance between the “critical” and “realism” aspects of this is Michael Polanyi. He argues that there are five points of comparison between the ways in which science and theology pursue truth: moments of enforced radical revision, a period of unresolved confusion, new synthesis and understanding, continued wrestling with unresolved problems, deeper implications. Because scientific experiments try to eliminate extraneous influences, he believes they are atypical of what goes on in nature. He suggests that the mechanistic explanations of the world that have continued from Laplace to Richard Dawkins should be replaced by an understanding that most of nature is cloud-like rather than clock-like. He regards the mind, soul and body as different aspects of the same underlying reality—”dual aspect monism”—writing that “there is only one stuff in the world (not two—the material and the mental) but it can occur in two contrasting states (material and mental phases, a physicist might say) which explain our perception of the difference between mind and matter.” He believes that standard physical causation cannot adequately describe the manifold ways in which things and people interact, and uses the phrase “active information” to describe how, when several outcomes are possible, there may be higher levels of causation that choose which one occurs. Sometimes Christianity seems to him to be just too good to be true, but when this sort of doubt arises he says to himself, “All right then, deny it,” and writes that he knows this is something he could never do. The intelligibility of the universe: One would anticipate that evolutionary selection would produce hominid minds apt for coping with everyday experience, but that these minds should also be able to understand the subatomic world and general relativity goes far beyond anything of relevance to survival fitness. The mystery deepens when one recognises the proven fruitfulness of mathematical beauty as a guide to successful theory choice. Polkinghorne accepts evolution. Following the resignation of Michael Reiss, the director of education at the Royal Society—who had controversially argued that school pupils who believed in creationism should be used by science teachers to start discussions, rather than be rejected per se—Polkinghorne argued in The Times that there is a distinction between believing in the mind and purpose of a divine creator, and what he calls creationism “in that curious North American sense,” with a literal interpretation of Genesis 1 and the belief that evolution is wrong, a position he rejects. Nancy Frankenberry, Professor of Religion at Dartmouth College, has described Polkinghorne as the finest British theologian/scientist of our time, citing his work on the possible relationship between chaos theory and natural theology. Owen Gingerich, an astronomer and former Harvard professor, has called him a leading voice on the relationship between science and religion. The British writer Simon Blackburn has criticized Polkinghorne for using primitive thinking and rhetorical devices instead of engaging in philosophy. When Polkinghorne argues that the minute adjustments of cosmological constants for life points towards an explanation beyond the scientific realm, Blackburn argues that this relies on a natural preference for explanation in terms of agency. Blackburn writes that he finished Polkinghorne’s books in “despair at humanity’s capacity for self-deception.” Against this, Freeman J. Dyson called Polkinghorne’s arguments on theology and natural science “polished and logically coherent.” The novelist Simon Ings, writing in the New Scientist, said Polkinghorne’s argument for the proposition that God is real is cogent and his evidence elegant. Richard Dawkins, formerly Professor for Public Understanding of Science at Oxford, writes that the same three names of British scientists who are also sincerely religious crop up with the “likable familiarity of senior partners in a firm of Dickensian lawyers”: Arthur Peacocke, Russell Stannard, and John Polkinghorne, all of whom have either won the Templeton Prize or are on its board of trustees. Dawkins writes that he is not so much bewildered by their belief in a cosmic lawgiver, but by their beliefs in the minutiae of Christianity, such as the resurrection and forgiveness of sins, and that such scientists, in Britain and in the U.S., are the subject of bemused bafflement among their peers. Polkinghorne responded that “debating with Dawkins is hopeless, because there’s no give and take. He doesn’t give you an inch. He just says no when you say yes”and writes in Questions of Truth that he hopes Dawkins will be a bit less baffled once he reads it. A.C. Grayling criticized the Royal Society for allowing its premises to be used in connection with the launch of Questions of Truth, describing it as a scandal, and suggesting that Polkinghorne had exploited his fellowship there to publicize a “weak, casuistical and tendentious pamphlet.” After implying that the book’s publisher, Westminster John Knox, was a self-publisher, Grayling went on to write that Polkinghorne and others were eager to see the credibility accorded to scientific research extended to religious perspectives through association. Polkinghorne has written 34 books, translated into 18 languages; 26 concern science and religion, often for a popular audience. Jump up^ Eric Metaxas (13 October 2011). Socrates in the City: Conversations on “Life, God, and Other Small Topics”. Penguin Books. ^ Jump up to:a b c Participants, John Templeton Foundation, 2005, accessed 17 June 2010. ^ Jump up to:a b c d e f O’Connor, J.J. and Robertson, E.F. John Charlton Polkinghorne profile at gap-system.org; retrieved 23 March 2010. Jump up^ From Physicist to Priest, pp. 9–11; 23–29; 34. Jump up^ From Physicist to Priest, pp. 40–50. Jump up^ Henry Margenau & Roy Abraham Varghese (eds. ), Cosmos, Bios, Theos. Peru, IL: Open Court, 1992, p. 86. Jump up^ From Physicist to Priest, p. 9. ^ Jump up to:a b c d Reisz, Matthew. On the side of the angels, Times Higher Education, 19 February 2009. Jump up^ Third Way, December 2005, p. 34. Jump up^ For basic biodata see Who’s Who 2006. Jump up^ “Diary of Events” (PDF). Hong Kong Baptist University. November 2006. Retrieved 2 April 2007. Jump up^ Staff list, Psychology and Religion Research Group, accessed 25 March 2010. Jump up^ See, for example, John Polkinhorne. Exploring Reality: the Intertwining of Science and Religion. p. ix. Jump up^ John Polkinghorne (2007). Quantum Physics and Theology: An Unexpected Kinship. Society for Promoting Christian Knowledge. p. 6. ISBN 978-0-281-05767-2. Jump up^ Quantum Physics & Theology, pp. 15–22. Jump up^ Science and Christian Belief. p. 21. ^ Jump up to:a b Sharpe, Kevin (July 2003). “Nudging John Polkinghorne”. Quodlibet Journal 5 (2–3). Jump up^ From Physicist to Priest, p. 107. Jump up^ This and (unless noted otherwise) all subsequent quotations are from Chapter 3 ofScience & Christian Belief, also known as The Faith of a Physicist. Jump up^ Science and Theology, pp. 71–83. Jump up^ Science and Theology, p. 72. Jump up^ Science & Christian Belief, p. 76. Jump up^ Science and Theology, p. 75. Jump up^ Science and Theology, pp. 81–82. Jump up^ Polkinghorne, John (2003). Belief in God in an Age of Science. New Haven, CT: Yale Nota Bene. p. 14. ISBN 978-0-300-09949-2. Jump up^ ‘Creationism’ biologist quits job, BBC News, 16 September 2008. Jump up^ Polkinghorne, John. “Shining a light where science and theology meet”, The Times, 19 September 2008. Jump up^ Blackburn, Simon. An Unbeautiful Mind, a review of John Polkinghorne’s The God of Hope and the End of the World, The New Republic, 1 August 2002. Jump up^ Dawkins, Richard. The God Delusion, Houghton Mifflin Co, 2006, p. 99. Jump up^ Polkinghorne, John (2009). Questions of Truth. Louisville, Ky.: Westminster John Knox Press. p. 29. ISBN 978-0-664-23351-8. Jump up^ Grayling, A. C. “Book Review: Questions of Truth: God, Science and Belief by John Polkinghorne and Nicholas Beale”, New Humanist, Volume 124, Issue 2, March/April 2009. John Polkinghorne on the “consequences of quantum theory” (for theology), accessed 9 July 2012. Video interview with Polkinghorne, accessed 25 March 2010. Knight, Christopher C. (2012). “John Polkinghorne” in The Blackwell Companion to Science and Christianity J.B. Stump and Alan Padgett (eds.) (Wiley-Blackwell). Macfarlane, Alan (2008). Interview of John Polkinghorne, 10 November 2008. Pannenberg, Wolfhart (2001). “Response to John Polkinghorne”. Zygon 36 (4): 799–800. doi:10.1111/0591-2385.00398. Polkinghorne, John. “Reductionism”, Interdisciplinary Encyclopedia of Religion and Science, accessed 25 March 2010. Semple, Ian (2009). From physicist to priest: A quantum leap of faith, The Guardian, 9 April 2009; interview with Polkinghorne. Smedes, Taede A. Chaos, Complexity, and God: Divine Action and Scientism .Louvain: Peeters 2004, a theological investigation of Polkinghorne’s (and Arthur Peacocke‘s) model of divine action. Runehov, Anne L.C. “Chaos, Complexity, and God: Divine Action and Scientism by Taede A. Smedes”, Ars Disputandi, Volume 6, 2006. Southgate, Christopher, ed. (1999) God, Humanity and the Cosmos: A Textbook in Science and Religion T&T Clark. Relevant extracts. Steinke, Johannes Maria (2006) John Polkinghorne – Konsonanz von Naturwissenschaft und Theologie Vandenhoeck & Ruprecht. Investigates Polkinghorne’s theory of consonance, and analyses its philosophical background. Wright, Robert. Video interview, Slate, accessed 25 March 2010. O’Connor, John J.; Robertson, Edmund F., “John Polkinghorne”, MacTutor History of Mathematics archive, University of St Andrews. Although not converting, Charles Darwin like Antony Flew struggling until his dying accepting that the universe came about by chance!!! Antony Flew answers the criticisms of Richard Dawkins in 2008!!! Roy Abraham Varghese: Antony Flew’s paper THEOLOGY AND FALSIFICATION became most widely reprinted philosophical publication of last century!